Canada's largest province is also one of its most beautiful and intriguing. Quebec - famously French, historic and strikingly beautiful - is a joy to traverse by car, motorcycle or RV. From large urban cities to rural communities, maritime towns, and mountain getaways, Quebec offers a rich cultural experience that is unique in North America. Quebec is large, with the vast majority of the population living near the Saint Lawrence River, especially between Montreal and Quebec City. This proposed road trip covers barely an iota of the province, focussing on Quebec's southwest-northeast corridor on either side of Saint Lawrence and very little of the province's far north which is rural and less accessible. Accommodation during your trek can include hotels, motels, bread & breakfasts or campgrounds, of which there are many across the province. As you move away from the more densely urban Montreal - Quebec City region, accommodation will be more localized (fewer familiar hotel chains) and French will be spoken more than English. That said, restaurant, many hotel and retail staff across Quebec will be somewhat conversant in English. Any road trip in unfamiliar territory begins with an education in the relevant driving rules, regulations, and overall safety. Driving in Quebec is much like the rest of Canada and similar too to the United States. The roads are, for the most part, well maintained, safe, and clearly marked. Drivers use the right-hand side of the road. Speed limits are posted in kilometers per hour. Common speed limits in Canada include 40 km/h max (25 miles/h) in residential areas, 50km/hr (31 m/hr) in cities, 80km/hr (50 m/hr) on two-lane highways, and 100 km/hr (62 m/hr) on major highways. Signs may be in English, French or both. Many are intuitive but some may be confusing so it wouldn't hurt to familiarize yourself with French language signage. Be aware that in summer, a two-week "construction holiday" in Quebec sees a quarter of the population taking their summer holidays. Simultaneously, roads are being repaired and the result is often painfully slow traffic. Montreal is a major aviation hub, so flying here to start your journey is a natural choice. Alternatively, you can fly to Plattsburgh International Airport (PBG) in Vermont, U.S.A. and make the 75-minute drive to Montreal. French and English are the main influences, but this unique Canadian city is truly international. Montreal has an energy and joie de vivre found in the world’s best cities. Perhaps the biggest draw in Montreal is the city's Old Town, which is a central riverside neighborhood, preserved in much of its original state, and profuse with French flare. Seventeenth-century architecture and cobblestone streets are just a couple of the features that make this area special. Montreal has a city population of 1.7 million, or 3.8 million when you take into account the greater Montreal region. Though Montreal is officially a French-speaking city (as is the province of Quebec), many of its residents, especially those in the retail and hospitality industries, speak English. Distance From Montreal to The Eastern Townships: 170 km (106 miles) / 2 hours. Consider continuing a little further to North Hatley for an impeccable stay at the Manoir Hovey, a Relais & Chateaux property. The Eastern Townships is a charming region of Quebec about an hour south of Montreal, sandwiched between the Saint Lawrence River's southern shore and the northeastern U.S.
At one time a haven for United Empire Loyalists, today the largely Francophone Eastern Townships has a population of about 330,000 people and is a swanky getaway for Montrealers and New Englanders due to its quaint heritage buildings, lakes, and ski resorts. Magog is one of the area's urban highlights. This historical town was famous for its textile production. Since fabrics now are mostly imported, Magog has reinvented itself as a cultural destination brimming with boutiques and galleries. Continuing east along the north shore of Saint Lawrence River and you'll hit Quebec City — the official capital of the province of Quebec — which offers an experience unlike any other in North America. Chosen for its strategic position at a point high on the river, this super-sized version of Old Montreal is steeped in history and flush with European charm. Cobblestone walkways, well-preserved 17th-century architecture, sidewalk cafés and the only North American fortress walls that still exist north of Mexico, have all contributed to Quebec City's status as a UNESCO World Heritage Site. This place is bustling year-round, but especially in July and August and during the Quebec Winter Carnival. Hotel choices range from elegant boutique hotels in the Old City to larger chain hotels and, of course, the iconic Chateau Frontenac. There is so much to do and see in Quebec City that two nights is probably the minimum stay to take it all in. On your way out of town be sure to stop at nearby Montmorency Falls (taller than Niagara Falls!) and Isle D'Orleans, which is a thriving agricultural community and haven of fresh berries, apples, potatoes, sprawling fields, colorful farmhouses and other country charms. Want to get out of town? Head 30 minutes north to Jacques Cartier National Park an expansive mountainous plateau cut by deep valleys open to visitors for rafting, inner tubing, fishing, kayaking, canoeing, camping and more. Or, head to Valcartier Winter Playground, 20 minutes away from Quebec City with acres and acres of hills, ponds, play structures, all constructed and groomed with slip-sliding in mind, whether by tube, raft, skates, or cart. Pure, unadulterated fun. There are lots of places to stop between Quebec City and La Malbaie, a stretch known as the St. Lawrence Route (Route du fleuve). This scenic drive covers 50 km (30 mi.) on Highway 362 between Baie-Saint-Paul and La Malbaien southern Quebec's Charlevoix region, known for its agricultural prowess. This scenic drive through Charlevoix is lined with picturesque towns and villages and farms backed by mountains on the one side and the St. Lawrence River on the other. About a half hour outside of Quebec City the 17th-century Sainte-Anne-de-Beaupré shrine cuts an impressive image along the shores of the Saint Lawrence River. Thousands flock here for the apparent healing powers of the chapel. The final stop on the route, Malbaien, is home to the famed Manoir Richelieu, one of Canada's grand historic railway hotels. The hotel boasts an extraordinary location with exceptional vistas as well as three pools, tennis courts, an 18-hole golf course, and a casino. There's not much of a drive between Malbaie and Tadoussac, but you will definitely need a full day or two to explore this region and take a whale watching excursion. Tadoussac is one of Canada's premier whale watching destinations. Located at the mouth of the Saguenay River, this historic town was first settled by Europeans in the early 1500's and became home to the country's first trading post in 1600. The Saguenay River drains into the Saint Lawrence River and this mix of Atlantic Ocean salt water and inland fresh waters cultivates an optimal environment around Tadoussac to host a large number of marine animals, including fin, minke, blue, and beluga whales. Whale watching can be done in a number of ways from the Tadoussac's harbor: on a larger boat, by smaller, nimbler Zodiacs, by kayak or from land. Reservations are highly recommended for your whale watching excursion and your accommodation. If you would like to explore the region in more depth, visit the adjacent Saguenay Fjord National Park (Parc national du Fjord-du-Saguenay), which lies along the shores of the Saguenay River and is open to visitors for camping, whale watching, boating, and more. The park offers huts and other rustic shelters for accommodation. After Tadoussac, head to the south shore and begin your journey across the Gaspé Peninsula, which begins with a ferry ride across the Saint Lawrence River out of Les Escoumins. Reserve your ferry spot online. After making your way across the Saint Lawrence River by ferry, you'll arrive in Trois-Pistoles and embark on your exploration of the Gaspé Peninsula. This Quebec region's geography puts it in close proximity to the Atlantic provinces with which it shares many maritime features, including rugged shorelines, ample fishing, and a laid-back, friendly population. Enjoy the scenic riverside drive on the south shore's Hwy 132, stopping for lunch at Reford Gardens, a 1920s property notable for its imaginative landscape design and unique botanical collection, especially given the challenging growing conditions of the Quebec south shore. Elsie and her husband Robert Reford lived at Reford Gardens and left behind a remarkable collection of photographs that depict life in the early 20th century on display in the small but entrancing gallery. After lunch, continue along the same highway, passing by luscious river vistas and quaint seaside towns, until you reach Saint-Anne-des-Monts. From here, take Route 299 to the Parc national de la Gaspésie, a stunning protected space with many scenic though challenging hikes. Camp or treat yourself to a stay at the Gîte du Mont-Albert, a gloriously situated lodge in the park with chalets, cabins and lodge guest rooms available to reserve. There's a good chance you'll share some space with local caribou. 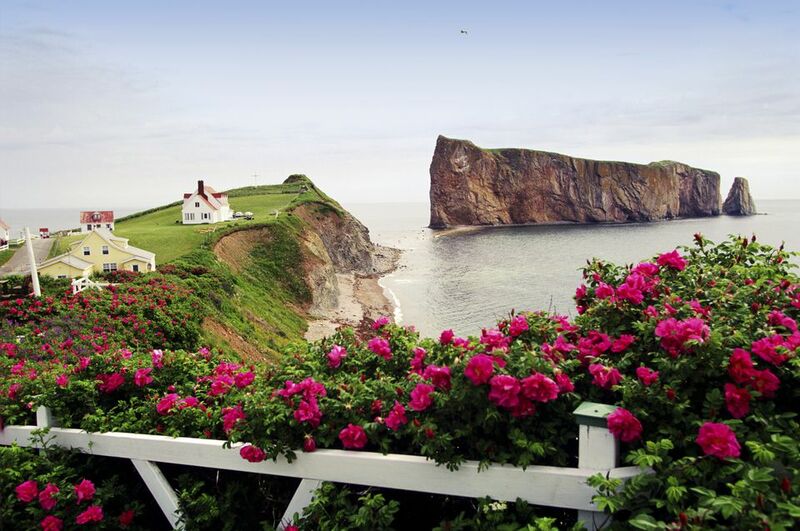 From Gîte du Mont-Albert, hop on the 198 route and make your way to the Gaspé Peninsula's biggest draw by far, Percé. The town's fame is due to the immense limestone formation with a "pierced" (percé) arch that transforms it from mere rock into a sculptural work of art. However, there is much more going for this quaint, yet visually dramatic town. The famous rocks are easily seen from shore but boats are readily available to get you up close. Don't miss a visit to Bonaventure Island, just a couple of kilometers off Percé's shores is which is a migratory bird sanctuary for the northern gannet and has over 50,000 pairs of nesting birds, the second largest population in the world. It is an incredible spectacle to see them nesting and nuzzling. In addition, if you have time, Forillon National Park offers not just green space for hiking but a lighthouse, a heritage fishing village, small informational gallery, and a rocky beach, all with a layered craggy backdrop that has been thwarted by the elements for more than a million years. From Percé, it is about an 11-hour drive to get back to Montreal. Break that up into two more reasonable drives that allow you to enjoy a little of the south shore scenery and culture. By getting back on Hwy 132, you will make a complete loop of this mostly shoreside scenic Gaspé drive. Stop for the night in Kamouraska, about 15 minutes off the highway on the water. This colorful community has been named one of the top 20 most beautiful villages in the province of Quebec. Many of the villages that dot the Saint Lawrence shore were resort towns in the 19th century for wealthy Montrealers or New Englanders. Kamouraska has retained its appeal and continues to draw visitors to peruse its lovely main street and shop its local, artisan fare. Take a quick route back to Montreal on the Trans-Canada Highway, but don't miss a stop at Fromagerie Lemaire, just off the Trans Canada Highway in Drummondville. They serve a wide range of poutine, including a vegetarian version. There is also a cheese shop. Charlevoix is a lovely agricultural region of Quebec you may not know. Staying in Canada for the March Break? Here are some travel ideas. The best, most uniquely Canadian vacations to add to your bucket list. What Are the Best Ski Resorts in Canada?